When purchasing a mattress, it is very important to thoroughly research the product before you buy it. Mattresses are intended to last nearly a decade and can be very expensive. For those who have been interested in a comprehensive guide on the Tuft and Needle Mattress, we have included some basic features, pros and cons, and a final verdict for anyone who has been curious about the properties of this mattress and want an unbiased review before purchase. T&N Adaptive foam: A foam created specifically by the company with the customer in mind. It boasts to be not a memory foam nor a latex material, but the company’s very own, custom designed foam created off of customer feedback. Supportive Base Layer: The company’s T&N Adaptive foam, combined with the supportive base layer, provides a comfortable and well-supported mattress for back, stomach, and side sleepers. Ideal Support: This mattress is great for all sizes. With more pressure comes more support from the mattress. Cooling Material: Designed to help keep you cool while you sleep, the foam pulls heat from the body and removes it from your mattress. 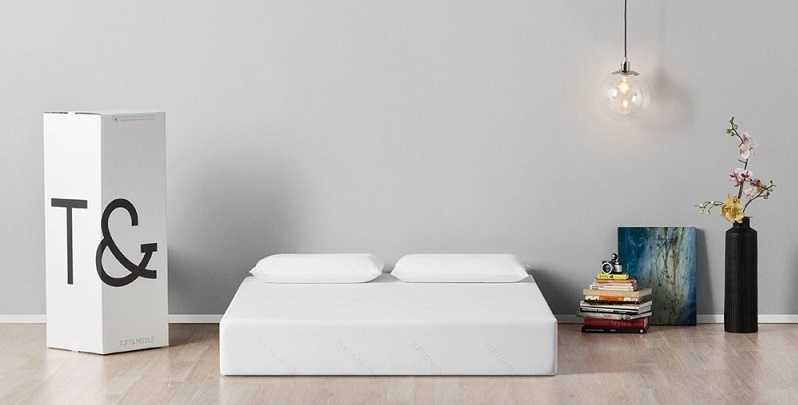 Versatile: The Tuft and Needle mattress is compatible with many different bed frame types. Whether you intend to keep your mattress on the floor, on a box spring, or on a slatted frame, this mattress is designed to work well with all types of frames. Warranty and Trial: This mattress, per the manufacturers website, comes with a 100-night trial and 10-year warranty. Warranty: The ten-year warranty is a great feature that comes with the mattress. Even better is the 100 night trial so you can make sure you really love the mattress before you fully commit to purchasing it. Shipping: The mattress ships straight to your house wrapped in a box. It also doesn’t have the “new mattress smell” that is common with many foam mattresses. Price: For a good quality mattress, this mattress has an exceptional price that is very affordable. Comfort: While many consumers expect a foam mattress to be hot, this one is surprisingly cool and stays that way all night long. It is also very firm for different sleep types. Overall, it is a very comfortable bed. Versatility: You don’t need to buy a special bed frame or box spring to use this mattress. This not only saves you money, it is very convenient. The versatility of this mattress is a definite plus. Side Sleepers may have some complaints about this mattress. Heavier individuals may not get as much comfort out of this mattress as lighter individuals. It is an online purchase, so you can’t “try it out” first. However, this is remedied with the 100 night trial available through the manufacturer and a 10-year warranty in case it is defective. Some may notice that it loses its firmness after a while. Those who want a good mattress at a great cost. People who have problems staying comfortable at night. People who need more time getting comfortable with a mattress before committing to it. People who need multiple options when it comes to frames, or don’t have a frame to keep their bed on. People who want to try out a mattress in the store, this one is only available for purchase online. People who are side sleepers. Some customers have noted that side sleeping isn’t quite as comfortable on this mattress. People who require maximum firmness. While many customers note that this mattress is firm, some say that it isn’t firm enough for their comfort level or that it does not maintain its firmness. Overall, this mattress is a great purchase for the price. It is a great buy for those who require a firm mattress with cooling properties and would like to give it a trial run before committing to a full purchase. While those who sleep on their side or require extreme firmness may not like this mattress, many people seem to believe that this isn’t a huge issue. The final decision? This is definitely a mattress worth trying out. And hey, if you don’t like it you have 100 days to return it back to the manufacturer.